The past season has seen some remarkable performances from GB's young cross-country skiers. This reflects the successes of the clubs which have been developing the skiers, and the British Nordic Development Squad, which offers young people aged 11-23 the chance to enter the sport. On Sunday 10th May, Roy Young, manager of the GB Nordic Ski Team, will be in London to meet with aspiring athletes interested in cross-country ski racing and coaches interested in developing young skiers. The aim is to help individuals to get into the sport, and to help organisations and people seeking to develop the sport in the region. Roy is keen to expand the pool of athletes entering the British Nordic Development Squad. He will be joined by members of the GB team, who will be in London for testing and who will be taking part in a rollerski race later in the day. At the end of the day, there will be an opportunity for the squad coaches and athletes to answer questions from participants, coaches and parents. Where & when: the session will take place at Hillingdon Cycle Circuit in West London from 10.30am-5pm, Sunday 10th May. 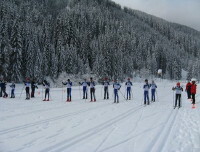 B: coaches interested in teaching cross-country skiers to young people. The team will be guests of the London Region Nordic Ski Club, who will be holding a coaching session and will be running the rollerski race on the day. The British Nordic Development Squad is an organisation catering for 11-23 year olds interested in getting into competitive cross-country ski racing. The development squad feeds athletes into the Snowsport GB Nordic teams. The Nordic teams each have a selection criteria and specific aims. 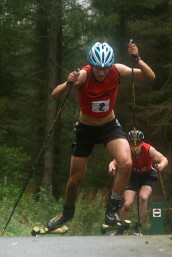 The squad holds several training camps throughout the summer and winter at various locations across, and works closely with the Nordic ski clubs in England and Scotland.